This olive oil bread dip is the perfect appetizer for any occasion. It has spice and flavor and pairs with anything! The best part is it literally takes minutes to throw together! 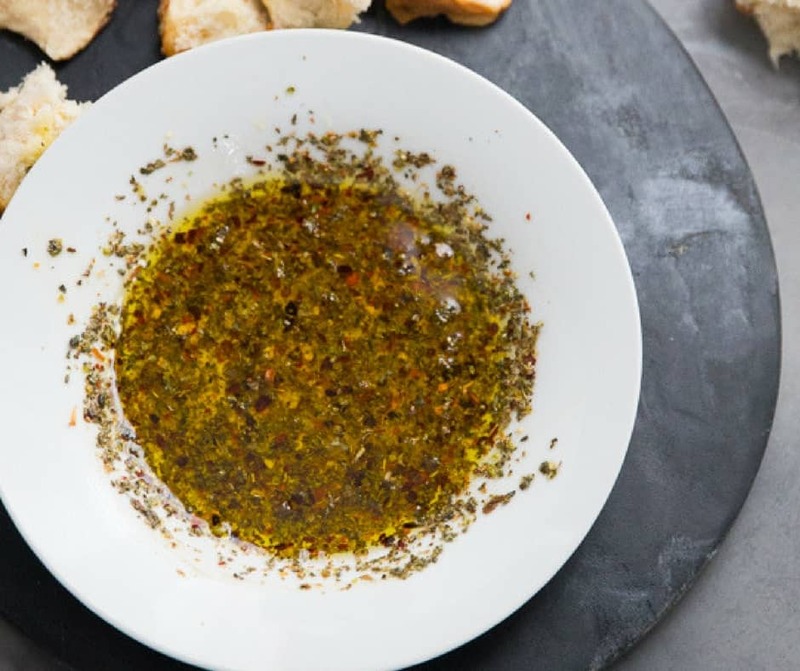 This olive oil bread dip is anything but complicated and for a person who tends to over think things, that is spectacular. I can attest the ease and simplicity of this recipe, so if you are short on time but what a recipe for entertaining, this is what you need! 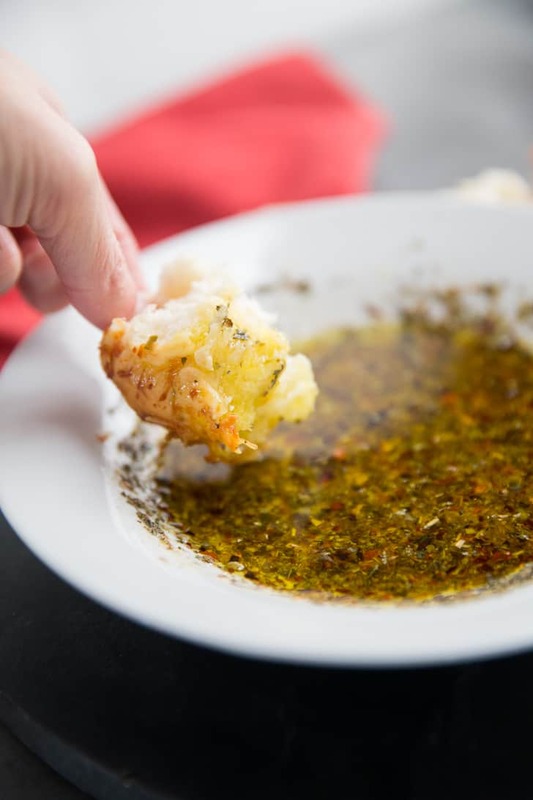 Olive oil bread dip if often found at Italian restaurants as a way to “wet” your appetite. This dip is often served in little bowls and it features olive oil infused with garlic and spices and it is served with freshly baked bread. It is comforting and addicting all at the same time! Which Olive Oil For Olive Oil Bread Dip? 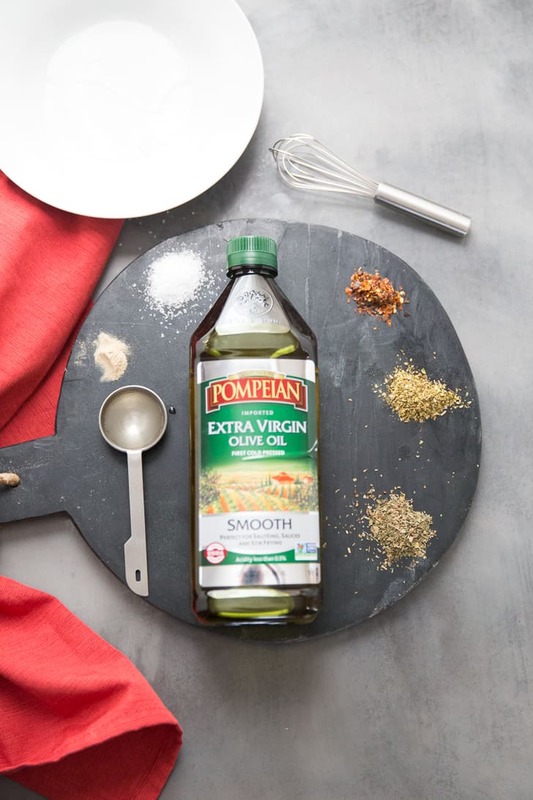 While I used Pompeian Olive oil for this recipe, you can use what you already have on hand, just be sure it is extra virgin olive oil. Extra virgin olive oil has a deeper flavor that is more robust and can handle the seasoning and the garlic. 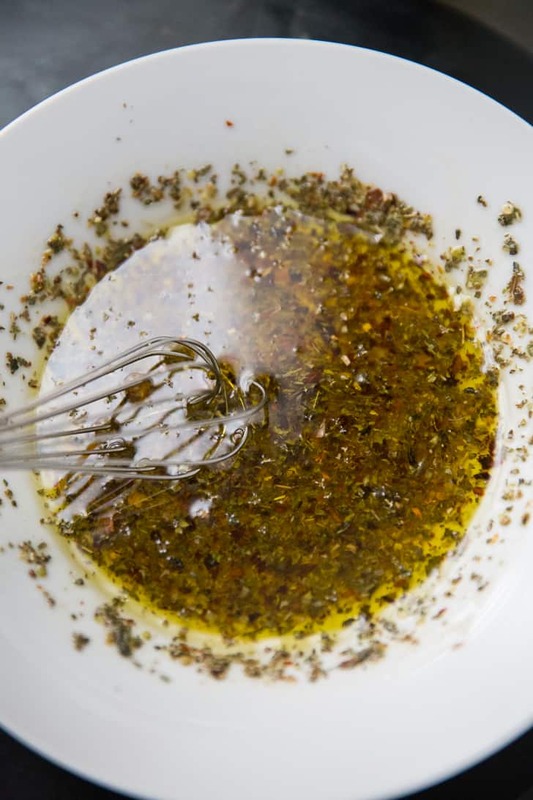 Light olive oil will be way overpowered by the seasoning blend whereas extra virgin olive adds not only holds the seasoning blend but adds in flavor as well. WHERE IS OLIVE OIL BREAD DIP RECIPE? 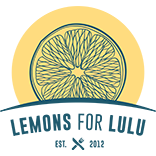 If you’d rather skip cooking tips, suggestions, handy substitutions, related recipe ideas – and get straight to the Olive Oil Bread Dip Recipe– simply scroll to the bottom of the page where you can find the printable recipe card. 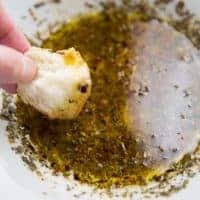 This olive oil bread dip is made with a handful of ingredients, many of which you probably already have in your pantry. As mentioned above, this recipe starts with extra virgin olive oil. The delicate flavor of this olive oil is mellow enough to allow each individual seasoning and her to stand out. A little white wine vinegar adds a touch of acidity without coming off too strong. Minced garlic, dried basil, dried oregano and parsley add more flavor while red pepper flakes and a pinch of paprika add heat. This dip is perfect with warm, crusty bread. If you are entertaining, you could serve King Ranch Chicken Dip, Garlic Bread Cheese Dip, Ranch Soft Pretzel Bites or Sticky Stout Chicken Wings . OR keep it simple and serve an antipasto platter and this olive oil bread dip; it is easy and always well received! 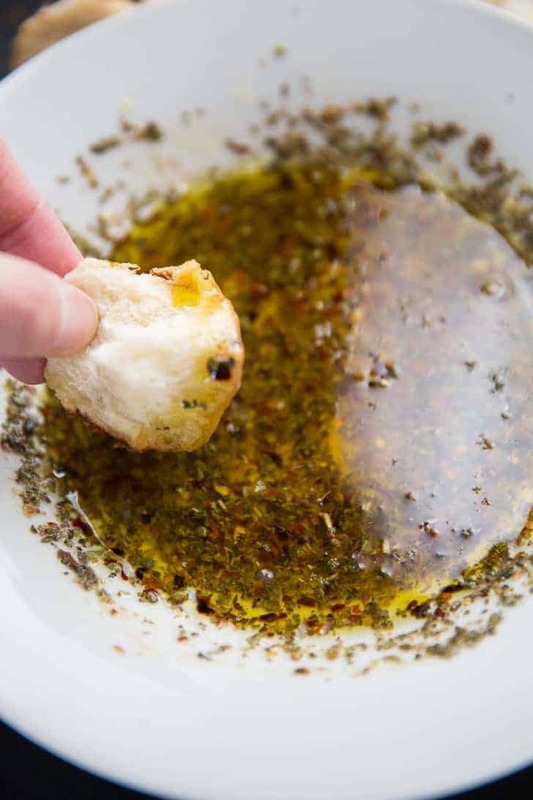 This olive oil bread dip is the perfect appetizer for any occassion. It is has spice and flavor and pairs with anything! The best part is it literally takes minutes to throw together! Place all the ingredients in a bowl and whisk until combined. Serve with warm crusty bread. I love making bread dip at home…so good! This one looks awesome! This sounds wonderful. What type of crusty bread do you recommend? I am partial to ciabatta bread! I can already imagine dipping some homemade crusty bread into this! So yummy! I know my family would love this – and I love how easy it is!! I will definitely have to make this bread dip this year! Sounds amazing! I would like to make this as a gift. How long does it last in a sealed bottle? Does it need to be refrigerated? Joy, I cannot say with certainty as I used mine within a day. I did find this article for you: http://living.thebump.com/need-refrigerate-infused-olive-oil-9438.html I would be sure to keep your jars refrigerated.